Link to fun elementary level reports to inform parents about student's art strengths. 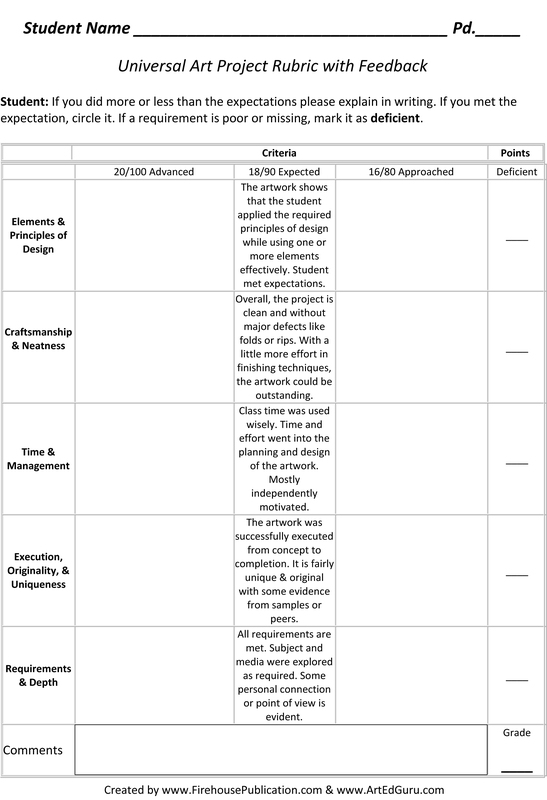 Grading Portions: When I want to grade a portion of a project or the use of an element or principle for a sketchbook assignment, I have found the following 2 rubrics helpful. 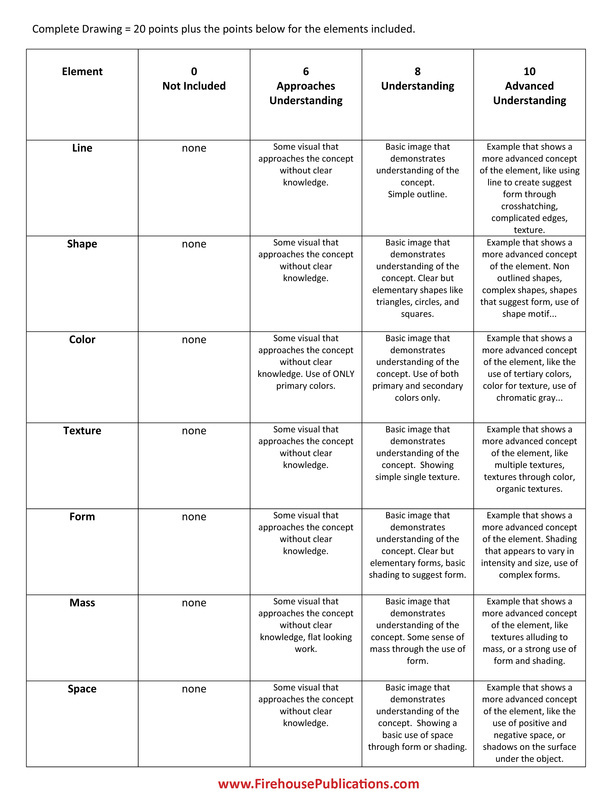 You can use the whole rubric to grade, like for an elements benchmark. However, when I grade sketchbooks, I like to give students the freedom of choice in what they draw, but I will let them know I will be grading their use of line, or shape. This way I am just grading the element, not the whole composition. 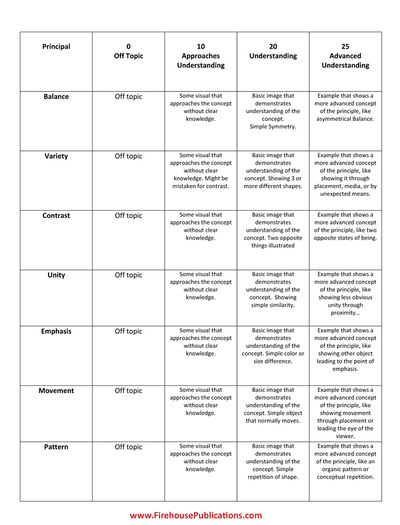 When I feel they have a good grasp of elements, I start grading their use of principles, again grading based on the line of the rubric, not necessarily the whole thing. For example, their first assignment is often "LINE." They can draw what they want, but I want it to focus on line, and we review the work and discuss regular use, and more advanced use of "LINE." Was it just an outline of a simple object, or did it have complex edges? Did the student just use contour lines, or was line used to crosshatch and shade? Then they do "LINE" again with a different drawing, and I should see improvement. 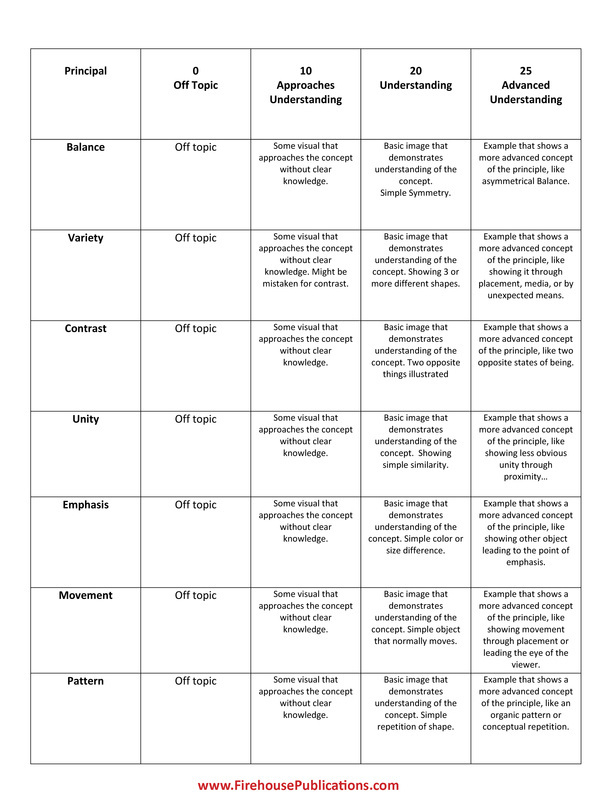 I have included an exemplar for elements that I use in my benchmark testing, More assessments can be found in the resource at the bottom of this webpage in Art Assessments. You'll find it under the cookie eating Mona Lisa, so scroll down a bit. The center collumn should be what is expected and students justify in writing what they did better than expected on the left, and deficiencies on the right. 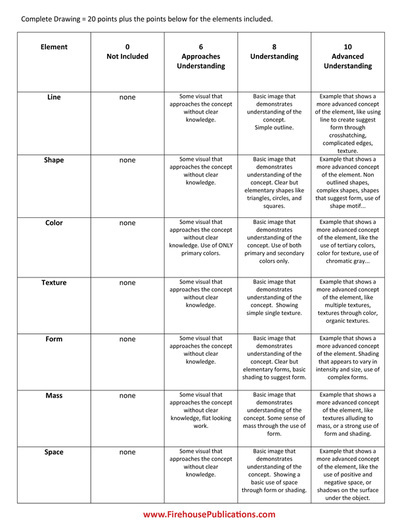 Below is my project rubric I use for most projects. A colleague and I felt the need for a single rubric that would work for many (if not all) projects. I have since made many modifications to the rubric you see here. Feel free to borrow it and alter it to meet your needs. 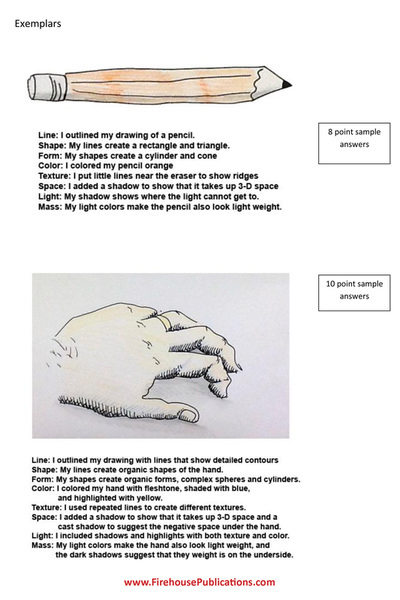 Art Assessments, available on Amazon.com or HERE with a discount. 30% when you purchase direct. Art Assessments includes various forms of art based evaluations from open ended responses, to traditional tests and quizzes, to daily class closure. Designed for middle school and high school art classes, this book includes a lot more, PLUS your purchase also entitles you to make copies for all your students! "Enclosed in this book are all of my exams, quizzes, tests, benchmarks, rubrics, and written assignments that I have developed over that last quarter century in my classroom. You are welcome to photo copy these pages for your students, or use the ideas I have included and augment them for your own program." This book includes tests in multiple formats of open ended, formative, interim, and summative assessments including scantron, fill-in, multiple choice, performance based assessments, interval skills assessments, and altered formats to meet 504/IEP requirements. Other assessments include open ended responses, core curriculum connections, project and testing rubrics, review guides, research paper guidelines and samples, art history introductions and worksheets, skills based assessments, vocabulary worksheets, perspective supplements, portraiture scale information, note taking pages, sub plan video worksheets, critique worksheets and sample, self evaluation forms, testing exemplars, daily closure and exit slips, and nearly 140 sketchbook ideas!